From the "Commandant's Own" U.S. Marine Drum and Bugle Corps to the U.S. Army Hellcats of the West Point Band, nearly every year at the Drum Corps International World Championships, DCI has the privilege of featuring active-duty military music groups. This past August in Indianapolis, DCI had the honor of hosting Sgt. Corrin Campbell of the U.S. Army Recruiting Command at Fort Knox, KY. Sgt. 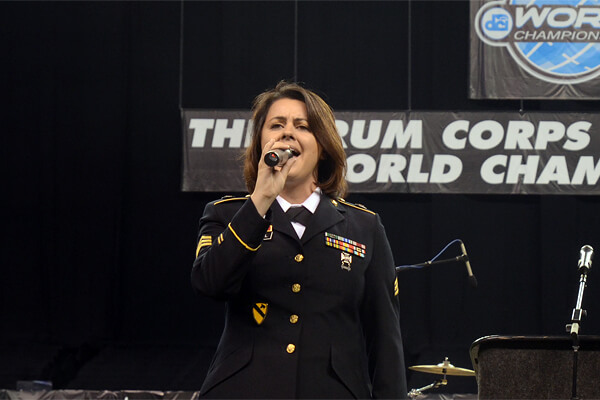 Campbell, a singer/songwriter and recording artist, sang the National Anthem to kick off the start of the DCI World Championship Finals on Saturday, Aug. 10. Marking Veterans Day, Drum Corps International extends its sincerest gratitude to our veterans for their dedication and sacrifice in serving our country. National Anthem at the 2013 DCI World Championships in Indianapolis.